In 2010, in South Africa, the French famously refused to get off the bus. Four years later, Cameroon refused to get on the plane to Brazil. Cameroon's second game in Brazil featured a row between teammates and an off-the-ball elbow that resulted in a red card for Alex Song. In truth, these ugly incidents were the result of frustrations that had been bubbling over for much of the team's qualification cycle. A week before their World Cup opener against Mexico, the Indomitable Lions declined to board their flight to the South American host country due to a disagreement over their World Cup bonuses. The problem is far from uncommon, unfortunately. Cameroon's national team had pulled a similar stunt before the 2002 World Cup. The team organized a sit-in at the Paris hotel of Roissy, refusing to leave until their demands were met. Are the players to blame? At first glance, yes. Many in the country would label them spoiled and overpaid stars, who should play for the national team for free. After all, with the exception of two Cameroon-based players, the rest play in Europe and earn ample salaries. So why would the national team players hold their own World Cup hostage for an extra dollar? The crux of the problem lies with the Federation of Cameroonian Football (FECAFOOT). The players' grievances are with the FECAFOOT officials and their handling of national team affairs, notably the issue of tournament bonuses. This issue is not uniquely Cameroonian, though. It is a rampant problem in many West African FAs. FIFA bylaws mandate that official government agencies cannot support, regulate or otherwise influence national FAs. Still, government meddling is something that happens in Africa with regularity. In the case of tournament bonuses, for countries like Cameroon and Senegal among others, it is the government that provides them. The FA simply collects the bonus and distributes it to the players. 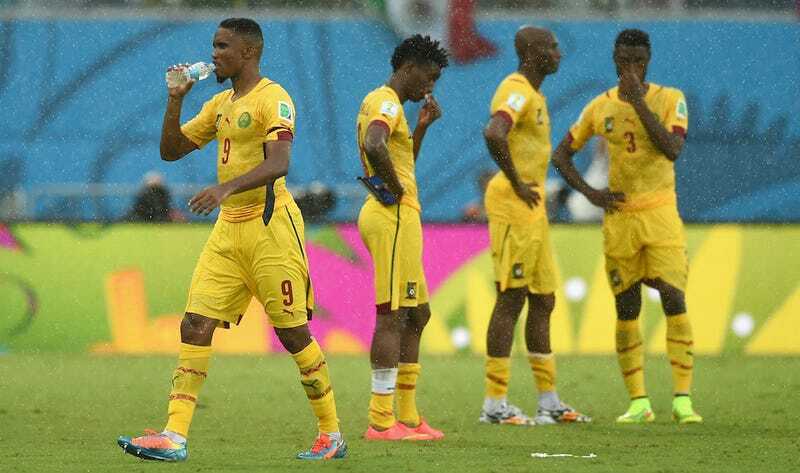 The Cameroonian players' aggravation, notably of team captain Samuel Eto'o, is that the percentages trickled down to the team are often lower than expected. A further frustration is that the money retained by the FECAFOOT is not reinvested in the development of football in the country. Cameroon legend Roger Milla expressed his frustration on RMC Sport, following the team's loss to Mexico, pointing to a lack of transparency which fosters an atmosphere of suspicion and distrust. In this light, Eto'o's discontent is somewhat understandable. Cameroon are at the end of a cycle of sorts. The Indomitable Lions have failed to reach the World Cup Round of 16 since their 1990 quarterfinal berth. Even on the continent, the four-time African champions have lost their luster, failing to qualify to the last two African Cup of Nations (AFCON). Even their 2014 World Cup qualification was dodgy, profiting from an administrative blunder that saw them take Togo's spot in the playoff qualifier against Tunisia. But Eto'o himself is no stranger to alienating those around him. At Chelsea this season, he righteously clashed with José Mourinho after the brash coach suggested his striker was too old. In the aforementioned World Cup playoff qualifier against Tunisia, he went so far as to suggest his teammates had conspired to keep the ball from him, passing to others but never to Eto'o. So between a mistrusted FA, a German coach in Volker Finke unable to influence the atmosphere of suspicion, a stagnating generational cycle, and an aging captain with perhaps too much power, Cameroon's problems are far more deep-seated than a simple issue of greedy players. But Cameroon's fans will wonder what the point of all this conflict was. Prior to Cameroon's opening World Cup game, in an open letter to his "brothers and sisters and compatriots," Eto'o had spoken of the situation and asked for the fans' support. "I fought for a cause I thought legitimate," wrote Eto'o. "The right for my teammates to receive their bonuses so that they may give the best of themselves, for their country." But after this emotional roller coaster that followed his holding FECAFOOT for ransom, Eto'o and his teammates showed anything but "the best of themselves" in Brazil. After the opening loss to Mexico, the Cameroon captain wasted no time in announcing an injury that would likely sideline him in the penultimate match against Croatia. On Wednesday, that match ended in a blowout loss that eliminated the team from advancement. Following a contentious few weeks, many are left raising their eyebrows at the news of the injury. After refusing to board a flight to Brazil, it was as though Eto'o had refused to even get on the pitch.